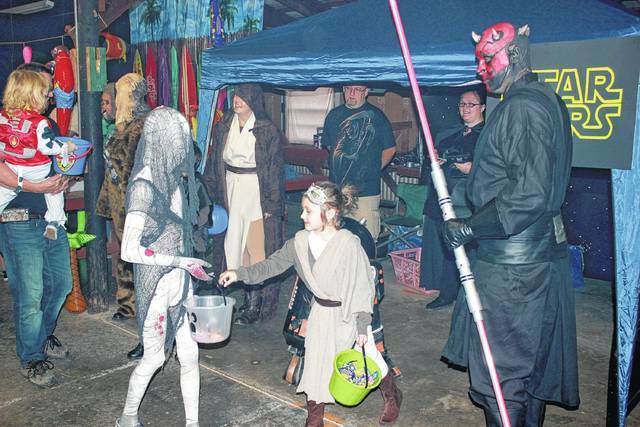 Jedi and Sith set aside their Star Wars animosity to hand out goodies during a past Holzer Health Center’s Treat Street event. GALLIA COUNTY — The time is fast approaching for what many may consider to be a dentist’s worst nightmare. Trick or treating season will once again hit Gallia County and there is expected to be plenty of candy-catching opportunities for children to gorge on a variety of sweet treats, not to mention the occasional chocolate bar confiscated by mom or dad. According to officials from the Gallia County Sheriff’s Office and Gallipolis Police Department, the county is set to have its treating hour from 5:30 p.m. to 6:30 p.m. the Thursday before Halloween on Oct. 25. This goes for Gallipolis and the surrounding villages as well. Parents will want to make sure children are dressed appropriately, says area law enforcement. Children should wear things that aren’t going to snag or tear or trip them, reflective clothing is best. Keep an eye on children when they are walking around streets. Never send them out in groups that aren’t supervised by adults. Always inspect where they are going. Make sure the areas that children are trick-or-treating in are friendly and that people are participating as some may not be handing out candy. Consider adding reflective tape or striping to costumes and bags for greater visibility. Think twice before using simulated guns, knives an swords. If props are to be used, be certain they do not appear authentic and are soft and flexible to avoid injury. Consider using a flashlight to see and be seen by others. Stay in a group, walk slowly and communicate where one is going. Only visit well-known neighborhoods. Remain on well-lit streets and always use the sidewalk. If no sidewalk is available, walk on farthest edge of roadway facing traffic. Cross streets at corners with well-marked crossways. Never cut across yards or use alleys. Never enter a stranger’s car for a treat. Don’t assume right-of-way. Motorists may have trouble seeing treaters. Just because one car stops does not mean others will. Notify law enforcement immediately of suspicious behavior. Email Halloween events and activities to the Tribune at gdtnews@aimmediamidwest.com for free publication consideration.